In the last eight months, Mosaic has bought businesses and brokered deals with both CF Industries, and Archer Daniels Midland in a way that should benefit each firm. During the last year and a half, fertilizer markets have seen prices tumble in the face of continued dealer reluctance to accept inventory risk, while raw food prices have been increasingly volatile after the drought of 2012. This has created a business environment that has demanded that companies shed businesses that do not fit into the companies' core competencies, and acquire or develop those that do. During the last eight months, Mosaic (NYSE:MOS) has bought businesses and brokered deals with both CF Industries (NYSE:CF) and Archer Daniels Midland (NYSE:ADM) in a way that should benefit each company. In the fertilizer space, dealer risk aversion culminated in July 2013 with the breakup of the Belarusian Potash Company, the joint venture controlled by OAO Uralkali and Belaruskali. 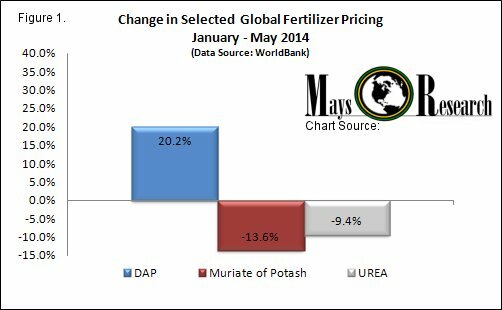 Since this time, global potash and urea fertilizer prices continue to try to find a bottom, while global phosphate prices have bounced in 2014. This should bode well for Mosaic, as phosphate sales have historically accounted for roughly two-thirds of revenues. As figure 1 below illustrates, global phosphate prices have rebounded by 20% through May 2014, while potash and urea prices are down by 13.6% and 9.4%, respectively. 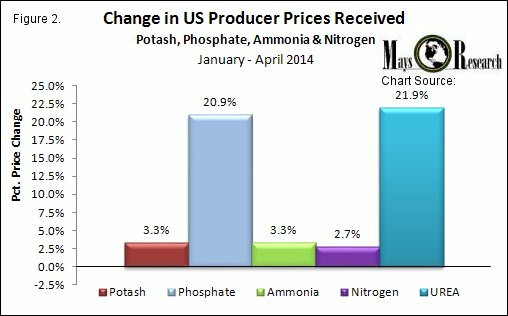 As shown in figure 2, U.S. phosphate prices are also up 20% in 2014. During the first quarter, Mosaic sold 2.7 million tons of phosphate at an average price of $414 a ton. They also consummated a previously announced deal to acquire the phosphate business of CF Industries for $1.4 billion in cash toward the end of the quarter. The deal is beneficial to both firms as it allows CF Industries to increase focus on its core nitrogen business, while Mosaic expands capacity and lowers production costs in its core business. CF industries also gets an attractive ammonia supply deal that will begin just before the beginning of 2017. UREA typically represents roughly 20% of CF Industries' nitrogen revenues. While UREA prices are down globally, through April 2014, prices in the U.S. have rebounded, as figure 2 illustrates. Mosaic also expanded its fertilizer distribution network in April when it agreed to buy fertilizer facilities in South America from Archer Daniels Midland for $350 million, which includes $150 million in working capital delivered by ADM at closing. Like the pact with CF Industries, this pre-arrangement has a supply contract attached, this time, with Mosaic being the beneficiary in terms of revenues. ADM will buy fertilizer from Mosaic so it may continue to supply certain key customers in Brazil and Paraguay. In my opinion, this deal is also good for both companies because it allows them to focus on their core competencies and earn higher returns. CF Industries and Mosaic face a tough road ahead, as fertilizer prices continue to search for a level that is appealing to both producers and buyers. Part of the equation that will decide this level is crop prices. 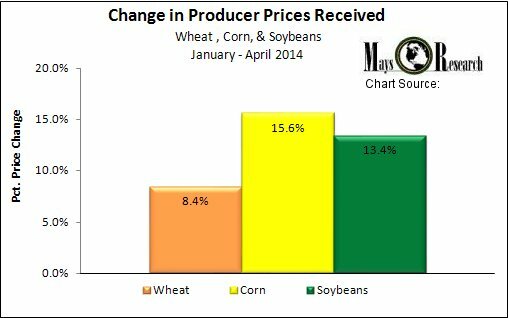 Although corn, wheat, and soybean futures were flat to down during the last quarter of 2013, they have rebounded somewhat in 2014, mostly due to stubbornly high soybean prices caused by fears that the South American harvest would be substantially lower than originally estimated. In my opinion, this has been a short-term rally during a longer-term fall in crop prices. I expect crop prices to move lower after the harvest gets under way in late summer, early fall. This will give crop producers and fertilizer dealers a greater sense of certainty and confidence with regards to future fertilizer pricing, and should help to solidify a cyclical price bottom, in my opinion. The lower crop prices should continue to help Archer Daniels Midland, as lower crop prices lower the company's input costs and lead to higher margins. Of course, the risk to all this is weather. No matter the outcome during the summer, all three companies have strengthened their competitive positions over the long term in what is an increasingly tough environment.